2018’s devastating Hurricane Michael struck the Florida panhandle at Mexico Beach and Tyndall Air Force Base in October at Category 5 intensity with 160 mph winds, the National Hurricane Center announced Friday. That’s 5 mph higher than Michael’s wind estimate of 155 mph at the time of landfall. In its post-storm tropical cyclone report, released the same day, NHC stated it culled an abundance of wind data measurements not available in real-time to add the 5 mph to Michael’s wind intensity. The data came from aircraft reconnaissance, ground observations, satellite intensity estimates, surface pressures, and Doppler radar velocities from Eglin Air Force Base and the NWS in Tallahassee. The report goes in-depth with the data, explaining the observations and identifying those that were believable—a 152 knot (175 mph) aircraft wind measurement at 8,000 feet in the southeast eyewall that yields a surface wind of 137 knots (158 mph)—versus those that were suspect—a 152 knot (175 mph) surface wind measured by the stepped frequency microwave radiometer (SFMR) instrument aboard a different aircraft, deemed too high based on experience with such intense winds in hurricanes Irma, Jose, and Maria in 2017. The upgrade makes Michael only the fourth Category 5 hurricane to hit the United States, joining a small, elite group of monster landfalling storms that include Hurricane Andrew (1992, 165 mph winds), Hurricane Camille (1969, 175 mph winds), and the Labor Day Hurricane (1935, 185 mph winds). Andrew plowed into South Florida, Camille landed on the Mississippi coast, and the Labor Day Hurricane devastated the Florida Keys. A realty building destroyed by Hurricane Michael’s winds on the east side of Panama City, Florida. Hurricane Michael roared ashore on October 10 as the strongest hurricane on record to strike the Florida Panhandle, with a storm surge around 14 feet above ground level, destroying Mexico Beach and much of Tyndall AFB, while tearing apart homes and businesses in Callaway, just inland, as well as in the eastern side of Panama City. Sixteen people died directly from the hurricane due to storm surge flooding and the intense winds, which blew down entire forests in the panhandle and destroyed crops across southern Georgia. Wind damage extended into the Carolinas. In the pages of scientific history, one often hears too much silence. A science–especially meteorology–is built by women who are rarely, if ever, remembered, let alone credited. When the Weather Bureau announced in the fall that radio weather reports were beginning to come in from our northernmost station, Point Barrow, Alaska, at latitude 71°…nobody would have guessed that the observer at this coldest and most inaccessible station, 450 miles north of other radio weather outposts, is a young woman, Mrs. Beverly A. Morgan, wife of the Army Signal Corps radio operator at the trading post there. …Mrs. Morgan and her husband live in the most primitive surroundings with only a few score people within hundreds of miles. Their only communication with the outside world, with the exception of their radio, will be a steamer once and sometimes twice a year. Occasionally even this powerful icebreaker is unable to penetrate to the post for months after her scheduled arrival. Shortage of food and other supplies has often caused serious handicap at the station, necessitating rationing of food. The temperature averages 19° F. below zero during the coldest winter months, and has been known to reach 55° below zero. Despite these hardships, Mrs. Morgan has pledged herself to make the routine observations twice a day regardless of weather, storms, sickness or other conditions. Many of the instruments require considerable mechanical attention and Mrs. Morgan is performing these duties in addition to her work as observer. The arduous observing is of great importance to cold wave forecasting in the United States, for Charles L. Mitchell, chief forecaster of the U. S. Weather Bureau in Washington, D. C., has found, by studies of reports for earlier years received by mail from this station and others, that the great invasions of cold air that sweep over much of the North American continent come in most frequently off the Arctic Ocean north of Alaska and are first observed at Point Barrow. Thus the reports from Mrs. Morgan will probably give us warnings of the approach of cold periods in winter some days earlier than heretofore. By MRS. ROSS WOODS, Cooperative Observer, Palmetto, Tenn.
For years it has been my desire to have a convention of the weather observers of our state, that I might meet my fellow cooperatives and exchange experiences with them, but such a convention up to this time has not seemed feasible. But now two mighty luminaries in the scientific world are in conjunction and with their combined attractive force, are drawing all the earth, great and small, toward them. The American Meteorological Society, for the first time in its history, and the American Association for the Advancement of Science, for the second time in its history, are met in our capital city. Truly opportunity is at the high tide of the spring tide and my erstwhile dream for years of too little importance to warrant fulfillment, is now a reality. And now that I have the opportunity to speak, my heart fills so with emotion the words are choked back and with Tennyson I cry, “And I would that I could utter the thoughts that arise in me.” That little latticed shed, or instrument shelter, in the yard back home does not seem to me to house mere instruments of wood and metal. Those instruments are a part of my family and as dear to me as some cherished heirloom to another. And why shouldn’t I love them when I recall the days that used to be?…. At first I loved them because of my father, later for their own sake or shall I say because through association with my own babies they became almost like one of the children. For more than twenty-two years they have stood in my yard with the pride of their thirty-eight years of unbroken record which…had stood until last summer I was absent for ten days and not even the most insistent S.O.S. could secure a substitute. How very, very often, I have the pleasure of showing a visitor or newcomer the maximum and the minimum thermometers, how they keep their register till I set them, explain the way to measure the rain, of keeping a daily record and noting the direction of the wind and character of the day, all of which must be made out once a month and sent to the Weather Bureau at Nashville. Usually this information calls forth words of appreciation and commendation, but there are some who are wont to ask, “Why do you do all this for nothing?” The easiest reply is: the compensation the Government could allow for this work would be small yet there are many incompetent and irresponsible persons, who would take it for the price, small though it be. But the truest and best reason is deep within my heart and could not be understood by a disinterested listener. In fancy I stand before the instrument, not at the time I set the thermometer and make my daily record, but this is the hour before bedtime and this is my observation; above me is the sky “that beautiful parchment on which the sun and moon keep their diary….I see it “sometimes gentle, sometimes capricious, sometimes awful, never the same for two moments together, almost human in its passions, almost spiritual in its tenderness, almost divine in its infinity,” and I am glad I am numbered even though in a humble way among those who scan the sky. Yes, we will remind readers of the exploits of the first woman to earn a Ph.D. in atmospheric sciences, the late Joanne Simpson who also served as AMS president (for example, today is a good day to listen to Carol Lipschultz’s biographical presentation on Dr. Simpson, here). And we will remember the story of Ann Louise Beck, who earned her Master’s degree in our science in 1922 while being instrumental in pioneering the use of the Norwegian cyclone model in weather analysis and forecasting in the United States. Her review paper on what she learned from her fellowship year in Bergen was probably the introduction to modern scientific forecasting for many American meteorologists in her day. But lets remember that despite the all-too-often silence of history, women have long been a pillar of meteorology. Because of course they were, even if the journals are mostly silent. In Dr. Simpson’s words, when she accepted the AMS Rossby Research Medal in January 1983. 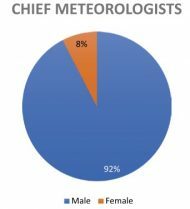 Women meteorologists can now stand on their own, without defensiveness—and soon without, I hope, the prefix “woman ” preceding “meteorologist.” They no longer need, want, nor should expect special treatment or attention. For this alone I’m very glad I’ve survived to this day. My receiving this wonderful, encouraging—though simultaneously humbling—recognition is not an anomaly, but on the contrary, is a harbinger. It says—loudly and clearly—to that increasing number of younger women contributing to our science that each of you can expect an opportunity comparable to that of your male colleagues to receive the recognition that you earn. I am confident, in fact, if I am accorded a normal life span, that I will be here to cheer for the next several of you when one of these great honors comes your way. With Maria, I was really scared. All of us have special circumstances right?…in our families. My mother is, almost, all the time in bed and my cousins are sick. They have to be with me; I have to contend with my problems, right? Because I was working. So you have to consider all these factors in all the decisions and all of the things are going through your head while maintaining the right attitude and being calm for the benefit of the rest of the island. Listen from the AMS website or your favorite podcast app as Monzón talks in depth about the personal and professional challenges of the hurricane–and a situation that in many varieties AMS members eventually must face: Warning your own neighbors, communities, and audiences of impending disaster as its bears down on your own families and homes. Then check out her keynote to the 2019 AMS Student Conference in Phoenix this January. Monzón explains how she turned the storm she calls “hell” into a “transformative experience” for herself and for her renowned science education museum programs for Puerto Ricans. Guru-shishya parampara is a centuries-old tradition in India that fosters a thoughtful exchange of ideas, expertise, and friendship between a guru (teacher) and shishya (student). The relationship between a guru and a shishya is an emotional, spiritual, and intellectual friendship built on the foundation of trust, respect and commitment. I got the opportunity to reflect on guru-shishya parampara during a panel discussion led by the AMS Board for Early Career Professionals. The session – “The Early Career Leadership Academy: Beyond Leadership to Mentorship” — aimed to reflect on the 2018 AMS Early Career Leadership Academy (ECLA), address leadership issues in the workplace and provide mentorship to students and early career individuals. Facilitated by my dear friend and colleague, Brad Johnson, the panel discussion featured Chris Vagasky from Vaisala, Kimberly Wood from Mississippi State University, and Alan Sealls from WKRG-TV. Brad, Chris, and Kim are all alumni of the inaugural class of 2018 AMS ECLA. What follows is a brief summary of what I learned from the panel discussion, and I hope it encourages you to consider applying for the 2019 AMS ECLA–the deadline is coming up fast. Mentorship is friendship. Over time, this relationship develops organically. You may not realize the role that mentors have played in your life until several years later, when you reflect on your experiences and think about the people who have guided you, supported you, and rooted for you, all along. Mentors come into our lives in various relationships. Some mentors are individuals who are more experienced and have more knowledge than you. Others are colleagues who may be at the same career stage as you. Parents, teachers, siblings, and even friends could all be mentors. Sometimes mentorship can be established in a structured manner. It needn’t be sought only from individuals who enjoy a high-profile career or are well established. Everybody has something valuable to offer. At any stage of your career, you are both a mentor and mentee. Communication is the key to a good mentoring relationship. Assessing the effectiveness and impact of communication in a mentorship is equally important. An effective mentor gives wise counsel, and the mentee feels comfortable speaking on issues that may be sensitive. Shared vulnerability between two individuals nurtures trust and builds honest mentoring relationships. However, being vulnerable also means taking a risk of harm, which you need to acknowledge and understand. You also need to know when to walk away from that relationship. Mentoring is a skill that can be developed over time through practice, participation, and partnership. Many individuals who wish to be mentors are confronted with imposter syndrome. Overcoming the imposter syndrome might entail developing a network of peers and colleagues who are able to provide validation, guidance, and support, when needed. If you feel like an imposter, chances are that others in your situation feel the same way. It is also important to acknowledge the benefits of being a novice in mentorship and recognize opportunities presented by failure. Confronting failure and acknowledging that you don’t know everything isn’t proof that you are worthless. It is an opportunity to grow. Cultivating a mindset of learning instead of performance allows you to view your limitations as growth opportunities thereby catalyzing self-improvement. Extending opportunities to others so that they too can learn and grow builds confidence and generates greater benefits for society. Mentorship is a doorway to complete transformation for both the guru and shishya. Done right, mentoring can benefit both: you get a chance to share your experiences, learn about challenges and opportunities that you aren’t aware of, and uncover ways of doing things differently. ECLA is designed to be a transformative peer-to-peer mentoring experience for early career leaders in weather, water, and climate science professions. As a result of the Academy, ECLA alumni have been able to take calculated risks in their lives, connect with colleagues in similar career phases, and acquire affective skills that are usually not taught in traditional academic setting. Most importantly, ECLA participants have been able to build deep and meaningful relationships with a diverse group of peers who support and advocate for one another, lead their organizations through uncertain times, and inspire change. Mentoring changed my life for the better and I sincerely wish that it transforms your life too. Please consider applying for the a place in the next AMS Early Leadership Academy. The application deadline is 8 March 2019; the Academy, including regular webinars, begins in April and leads to a meeting at Stone Mountain, Georgia, on 24-26 July. From there, the program continues onward with guru-shishya parampara. NOAA’s Cooperative Institute for Meteorological Satellite Studies (CIMSS) in Madison Wisconsin is pleased to announce a virtual science fair for students from grades 6-14 applying GOES-16 or GOES-17 data to investigate weather scenarios and natural hazards. ‘Pleased’ is probably too mild of a word to describe our enthusiasm around this project. Madison is after all, the birthplace of satellite meteorology and CIMSS founder Verner Suomi is widely known as the “Father of Satellite Meteorology.” Recent launches of the GOES-R, NOAA-20 and GOES-S satellites have made our building a very exciting to place to work! Our goal, and motivation, is to share our passion for GOES-R series data as broadly as possible. One way to reach students is through the spring 2019 virtual science fair, part of “The GOES-R Education Proving Ground” at CIMSS. A key element of this effort, from the get-go, has been a core group of educators working with CIMSS in close coordination NOAA scientists. 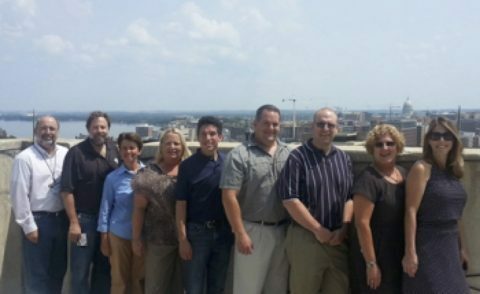 Above: The original GOES-R Education Proving Ground Team from 2014 – from left to right: John Moore, Tim Schmit (NOAA), Margaret Mooney (CIMSS), Vicky Gorman, Peter Dorofy, Craig Phillips, Brian Whittun, Amy Monahan, and Charlotte Besse. Most of the original teachers have rotated out of the core group. And sadly, Charlotte Besse, a Florida teacher, has since died of cancer – but not before attending the 2016 GOES-R launch with her family in tow! A major perk for winners of the GOES-16/17 Virtual Science Fair will be official GOES-T launch invites. Students will also receive $25 gift cards. Teachers coaching the winning teams will garner launch invites (no travel support) and conference travel support to attend and present at the 2020 American Meteorological Society (AMS) Centennial meeting in Boston. There will be three winning teams: middle school, high school and grades 13/14 (community college or university). GOES-R Educators from five different states will judge the science fair entries. We will be accepting entries between March 1st through May 3rd, 2019. Guidelines, scoring rubrics and other supporting resources are all on-line at http://cimss.ssec.wisc.edu/education/goesr/vsf. Please share with your favorite educator! How fast can an airliner go? Monday night a Virgin Atlantic Boeing 787-9 reached 801 m.p.h. en route from Los Angeles to London. Matthew Cappucci of the Washington Post reported the jet reached this amazing speed—a record for the Boeing 787-9 and probably the highest speed for a non-supersonic commercial flight—while cruising at 35,000 feet over the central Pennsylvania. I had set up a WMO committee this past summer to look into that very question—the strongest tropospheric winds (and so the strongest winds recorded on the planet). As we started to look at the data, we found that by far the strongest tropospheric winds are found east of Japan in the Pacific and normally occur right at this time of the year. They are associated with the normal area when polar and subtropical jets merge. The second area of max tropospheric winds are over New Hampshire and has the same thing happen—polar and subtropical jets merge. BUT unfortunately we ran into serious problems with the quality of extreme tropospheric wind measurements. My experts say that right now the quality of the data for those upper air extreme winds is not good enough to support an investigation for global fastest tropospheric winds. So we are not investigating that record until (and if) NCEI and other groups can establish a viable record for an extreme. We have seen data (again, not good to accept) that has winds in excess of 133 m/s or 297 miles per hour. It is likely that some of those values ARE good but we are still quality-controlling the radiosonde extreme dataset. With that in mind, we dug into the AMS journals archive and found a February 1955 Journal of Meteorology article by Herbert Riehl, F. A. Berry, and H. Maynard detailing research flights into the jet stream over the Mid-Atlantic states. They record one case of a 240-knot jet stream (276 m.p.h.) and another of 210 knots (241 m.p.h. ), each representing averages over 28 miles of flight path. So for now, just sit back and enjoy the flight. Planetary, synoptic, meso-alpha, meso-beta, local, and more—there are atmospheric scales aplenty discussed at AMS meetings. Enter microtopography, a once-rare word increasingly appearing in the mix in research (for example, here and here). The word is also coming up as researchers are getting new tools to examine the interaction of tornadoes with their immediate surroundings. Microtopography looks like a potential factor in tornadic damage and in the tornadoes themselves, according to an AMS Annual Meeting presentation by Melissa Wagner (Arizona State Univ.) and Robert Doe (Univ. of Liverpool), who are working on this research with Aaron Johnson (National Weather Service) and Randy Cerveny (Arizona State Univ). 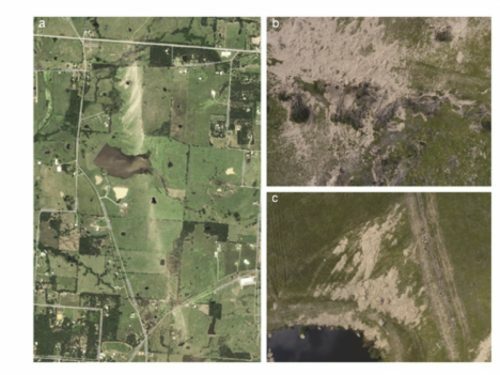 Their findings relate tornado damage imagery to small changes in local topography thanks to the use of unmanned aerial systems (UASs). 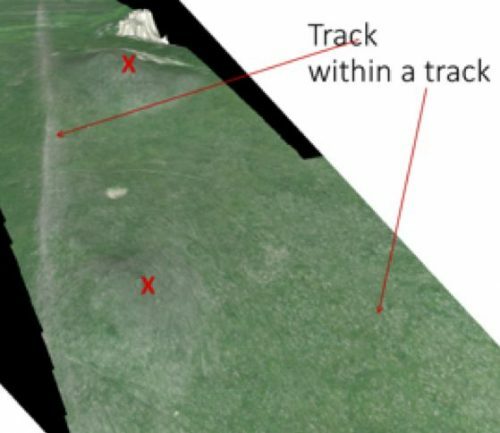 The advent of unmanned aerial vehicles (UAVs) has opened new windows on tornado damage tracks. Decades ago, damage surveys took a big leap forward with airplane-based photography that provided a perspective difficult to achieve on the ground. Satellites also can provide a rapid overview but in relatively low resolution. UASs fly at 400 feet—and are still limited to line-of-sight control and the logistics of coordinating with local emergency and relief efforts, regulatory and legal limitations, not to mention still-improving battery technology. However, UASs provide a stable, reliable aerial platform that benefits from high-resolution imaging and can discern features on the order of centimeters across. Wagner and colleagues were using three vehicles with a combined multispectral imaging capability that is especially useful in detecting changes in the health of vegetation. As a result their methods are being tested primarily in rural, often inaccessible areas of damage. 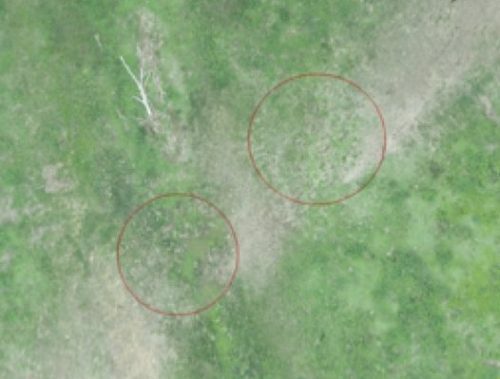 UAS technologies thus can capture evidence of multi-vortex tornadoes in undeveloped or otherwise remote, vegetated land. The image below shows a swath with enhanced surface scour over two hills (marked X). The arrow on the right identifies speckled white surface erosion, part of the main tornado wedge. 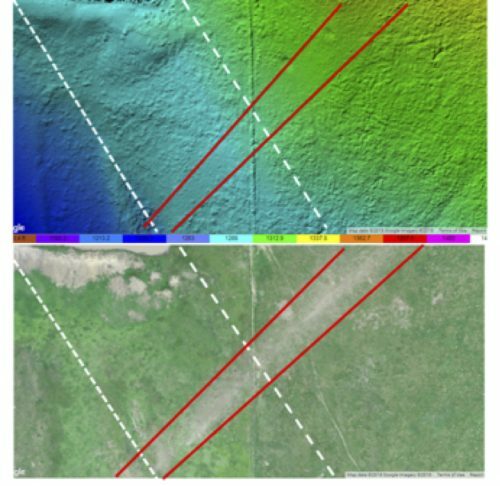 Such imagery explains why, among other research purposes, Wagner and Doe are developing the use of UASs in defining tracks and refining intensity-scale estimates.